As you can see the code is really linear and simply. 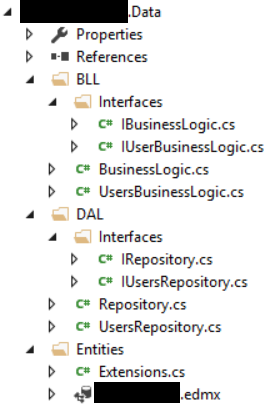 all classes are partial classes of Repository or BusinessLogic that inherit by IRepository and IBusinessLogic, these interfaces inherit all other entities interfaces then with one instance of Repository or BusinessLogic object can call methods of all entities. Main BusinessLogic initializes an Repository object and usually in web application project there is an instance of BusinessLogic. Most of the projects are simple CRUD operations so I'm wondering if there is some way to generalize these methods considering that the operations are always the same. Change only the entity and the property where query. You have a real interface pollution there. They do not provide any useful abstraction. Keep only one of them that you make generic. That's all you need. Lastly don't do it like this at all. Create a single repository where you put all the queries you need and you're good. There's no need to create a repository for each entity type. I bet most of the APIs you'll never use anyway. Entity Framework is already a repository so creating a CRUD wrapper for all entities is just a waste of time and having repositories just for the sake of having implemented the CRUD repository pattern is pointless. This repository virus spreads like a disease infecting all projects. Everone thinks they need a repository but they don't. What they need is just a bunch of queries to get the job done. As you can see IRepository already inherits IUsersRepository so there is no need to inherit both of the interfaces, you can simply inherit the derived one, namely IRepository. Same goes for your BusinessLogic class. Why do you need IBusinessLogic ? It's empty anyway, unless you are not showing some of your code there you better remove it. Your partial modifier seems redundant to me, your classes look more like a normal class, but I won't stress on that as it might count as a personal preference or company convention. Usually when you modify the database you should save the changes but you are not doing that in your AddUser, UpdateUser, DeleteUser methods. IRepository sounds like the base interface rather than IUsersRepository which is a lot more concrete. It's like putting a IDog as a base interface instead of IAnimal. Not the answer you're looking for? Browse other questions tagged c# repository n-tier or ask your own question.